1. The signup title should begin with DEPC Student Reservations and end with the semester you are enrolled in: fall, spring or summer. 2. Either from the Distance Ed web site or an email sent by your online instructor, you will get the hyperlink that takes you to the DEPC SignUpGenius web page. Since this address changes each semester, you will be sent that information directly from your instructor. You can also search SignUpGenius for our list by searching for signups created by m.schnell@sscok.edu. That page is at http://www.signupgenius.com/findasignup. 2. Scroll down the list until you find the day and time you want to reserve for your proctored assignment. Remember, each assignment will only be available for specified days. Be sure you choose the correct time and time zone to schedule your exam. It is possible to even schedule a date that has already passed, so double check that you’ve got the right date and time. If your exam is 2 hours long, then you need to sign up for 2 time slots, back to back. 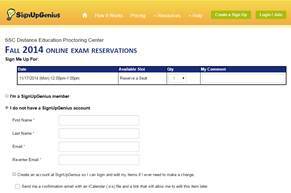 Currently, the reservations are only done in 1 hour increments. When you’ve found a day with available seats, check the blue Sign Up button on the right, then hit the Submit and Sign Up button at the bottom of the screen. The sign up list will look similar to this (different semesters may have a different color scheme. Any reference to “blue button” is just for the specific screen shot. Your sign up might be in green or red instead). 3. If you have an account already, you can select the “I’m a SignUpGenius member” option, and a pop-up box will appear that lets you log-in. 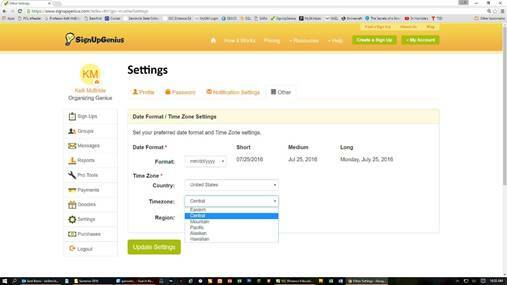 If you have not created a free account, you can fill in the information boxes and create an account. 4. At the bottom of this screen is an Additional Info section. You are required to complete this in order to make your reservation. Currently, you need to provide your SSC student ID number, choose your course from the drop down box, and select your instructor’s name from the second drop down box. You will then hit the “Sign Up Now” button at the bottom. 5. You will now see this screen that lets identifies the time of your appointment and gives you the option of adding this to your calendar. The program is set to send you an email reminder of your appointment 1 or 2 days before the scheduled time. 6. 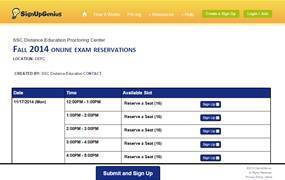 Students must bring proof of their reservations by printing out their confirmation email and adding the class, exam, and instructor name. For example, you would write: ENG 1213, McBride, MLA exam if you were taking a proctored test for Professor McBride's class. 2. Choosing EDIT lets you change any of the information you provided (ID, course name, instructor name). Here, you can confirm that you want to delete the appointment and even leave a message for the Distance Education team. If you need to reschedule the time, you must delete your first appointment and then go through the process of creating an appointment at the new time.